Swarthmore College students and members of Organizing for Survivors in the Dean of Students building during a two-day sit-in. On Tuesday morning a few dozen students gathered in Swarthmore College’s Dean of Students’ office and read her a list of demands. A long list of demands. Dean Elizabeth Braun was there, and said nothing. And soon, she left. But the students have been there ever since, growing from about a dozen to about 100 on Tuesday, a handful Tuesday night and then up to 300 at one point on Wednesday afternoon. They’re actually there right now — with no plans of leaving. “We’ll be here indefinitely,” said Priya Dieterich, 21, a senior at Swarthmore and a representative from a student group called Organizing for Survivors, or O4S. 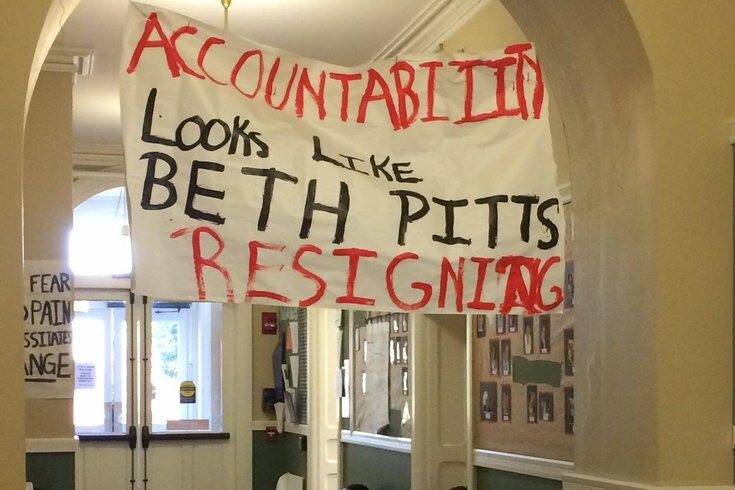 Swarthmore College student allies and members of O4S are demanding changes be made to the school’s process for reporting and investigating sexual assaults – including a change to the college’s Title IX policy – and the resignations of Braun, Associate Dean Nathan Miller and Associate Director of Public Safety Elizabeth Pitts. In the fall 2017 semester, both the Title IX coordinator and one of the college’s deans unexpectedly quit. According to the college’s independent newspaper The Phoenix, only six of 11 people hired as Title IX liaisons and resources in 2014 still work at the college. In campus-wide emails, Braun and Smith expressed “mixed emotions” at their abrupt departures, The Phoenix reported. Back in 2013 the school was under federal investigation for its failures in handling sexual assault on campus and for apparently retaliating against sexual assault survivors. A group of male and female students filed a complaint with the U.S. Department of Education’s Office for Civil Rights against the college in May of that year. "I will go to great lengths to protect our students' rights to peaceful protest and assembly. However, I can't support ad hominem attacks on individuals. I am evaluating every allegation that has been brought against members of the staff," Smith said in a statement to PhillyVoice. "I deeply regret any pain or burden students have borne unnecessarily due to our Title IX processes and procedures. I remain firm in my belief that we all share a commitment to ensuring that every member of our community is safe from violence of all kinds and able to live, work, and thrive on our campus," Smith added. The formation of O4S and all of the recent protests were initiated in February of this year when two students published essays in the student-run media publication called “Voices” detailing their experiences going through the Title IX process at the college. The group later held a student-run forum to see what kind of sentiments there were among students, and thus, the list of demands was born. Here is the complete list. Swarthmore President Valerie Smith issued a statement on Wednesday after members of O4S entered Braun’s office to read their demands. But Dieterich said O4S isn’t looking for more dialogue. They want an apology. “We want a real response, we want a real apology, and we want real action,” she said. “One of our demands is that the college administrators sign an apology letter to the survivors who they’ve hurt. That’s something they’ve neglected to do thus far." "We want a real apology," she said, "and we want to see actionable steps."